India registered a Total Unit Shipment of 1,082,181 units for the Indian Data Card Market in CY Q1 2013. HUAWEI emerged as the market leader in terms of Unit Shipments. According to 6Wresearch, the India Data Card market recorded Total Unit Shipment of 1,082,181 units in the CY Q1 2013. HUAWEI dominates the market followed by ZTE and Micromax. More than 45% of the Total Unit Shipments for the India Data Card Market falls under the price range of INR 1100 in CY Q1 2013. More than 20 vendors shipped Data Cards. Top three players collectively constitute 66% of the total market share. 99% are based on 3G network, whereas 77% of them provide speed up to 7.2 Mbps. More than 35% belong to EDGE Class 10 series. 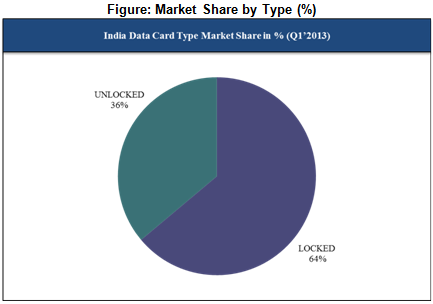 Locked Data Cards leads the Indian Market having 64% of the market share. Almost all the data cards support 3G data networks, whereas only around 10% belong to 4G network. The Universal Mobile Telecommunications System (UMTS) featured data cards amounted to more than 70%, whereas data cards with the High-Speed Downlink Packet Access (HSDPA) feature accounted for over 95% of the Total Unit Shipments. Further, out of the total data cards shipped, more than 85% are installed with Qualcomm Chipsets.